In the midst of all the planning, budgeting, and general mania of opening or redesigning a restaurant, finding the perfect restaurant chairs for your space can be fun. It’s great to get creative with different styles and colors, but the look is just the half of it. Any chairs you choose need to deliver on both style and quality, and while one is easy to see at a glance, the other is not. Here are some key aspects of restaurant chair quality to keep an eye on during your search. Marketers can make pretty much anything sound good - that’s their job. But even appealing descriptions like “walnut colored veneer” and “lacquered metal” can be true while still delivering a sub par product. Manufacturers should be transparent and upfront about the specifics of their materials, such as the species of wood and the gauge of steel used in their chairs. Unclear descriptions and evasive salespeople should serve as red flags that you won’t receive the value you need. Where are the materials sourced from? Likewise, transparency about the source of materials is key to purchasing a quality product. Any secrecy around sourcing should warn you away from a manufacturer. For ultimate quality assurance, look for chairs whose materials are sourced locally around the manufacturer from reputable suppliers. The best manufacturers will not only be upfront about their material sourcing, but will also be willing to work with you to deliver the best product for your restaurant’s values and needs. Your chairs, just like your food, your decor, and your online presence, are a representation of your brand, and for manufacturers, understanding this is just as important as using materials that will last. How are the restaurant chairs constructed? Here, we’re talking joints and welds. In wood chairs, look for mortise-and-tenon construction in the joints, where the end of one piece of wood (the tenon) is cut to fit perfectly into a hole in the piece it is being adjoined to (the mortise). Used by themselves, nails and staples are a bad sign, as is visible glue. The wood chair should be supported by a combination of nails, glues, and screws. For steel and aluminum chairs, keep an eye out for lumpy welds that don’t match the rest of the chair as they are a sign of sloppy and potentially weak construction. Good metal joints are hand-tailored, coped, and brazed. Chairs shouldn’t squeak, wobble, or twist when you apply pressure to the seat, back, or arms. Quality restaurant chairs are a product of careful design, engineering, manufacturing, and finishing, and excellence in each step should be reflected in the final piece. While bargain shopping for chairs may have the benefit of short-term cost savings, a truly quality product is backed by an extensive process that includes engineers, master craftsmen, skilled labor, and experienced manufacturing. Without even having to ask the manufacturer, you can evaluate the process of constructing your chairs by checking for consistency in welding, joints, upholstery, finish, paint, and surface texture. How confident is the manufacturer in the construction? Of course, any manufacturer will say they trust their product completely, but the real proof lies in the warranty. Even before you start peering at joints, the length and coverage of a warranty is a good litmus test for the quality of a manufacturer’s restaurant chairs. Be wary of short-term structural warranties, and ideally, hold out for a minimum five-year warranty. On top of the warranty, manufacturers who are committed to the quality of their restaurant chairs should be able to prove it. Testing a product according to BIFMA standards ensures quality construction and safe usage for high-traffic, high-use environments like restaurants. Compliance to BIFMA standards is voluntary, not compulsory, for US furniture manufacturers, and a manufacturer who is willing to go the extra mile is one you can depend on for your chairs. While style is critical in choosing your restaurant chairs, but quality should be what seals the deal. Luckily, by seeking out a manufacturer you can trust, there’s no need to compromise either. 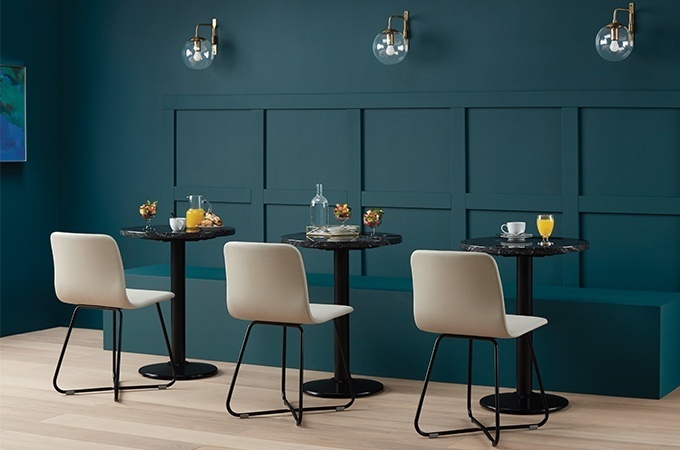 With both, your restaurant will benefit from great-looking chairs that last for years, delivering the return on investment that your business needs.